The bass guitarist of Italian Progressive Metal band Twinspirits here releases some of his own compositions…..with a little help from his friends. If you can envision a mix between Rush, Tommy Emmanuel and, to an extent, Stanley Clarke, you should get the musical gist of this quasi-instrumental album by Alberto Rigoni. 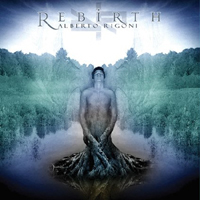 Although still quite young, Alberto has already reached enviable levels of musicality and “Rebirth” is a testament to this. He is a versatile bass player with an exciting range of ideas on how the bass guitar can be used as a form of expression in its own right. “Rebirth” reminded me of the dearth of Rock albums where the bass guitar is the main focus of the music. This is not to say that other instrumentations aren’t given opportunities to sparkle In fact the album boasts an impressive list of first-rate musicians, such as drummers Gavin Harrison (Porcupine Tree/King Crimson) and John Macaluso (Ark, LaBrie, Malmsteen, Masi, TNT), who both give sterling performances. There’s also ubiquitous bass player Michael Manring as well as a wide array of fellow Italian musicians such as guitarists Simone Mularoni (DGM, Empyrios) and Tommy Ermolli, the latter being Alberto’s band-mate in Twinspirits. At times the music in this album is psychedelic and atmospheric but the ‘Rockier’ music is found within the vocal tracks. There are in fact only 2 tracks to feature vocals: ‘Emptiness’ and ‘With All My Forces’. Jonas Erixon sings in them – his voice is melodic in a Coverdale sort of way but it did feel a bit low in the mix. The only track that I didn’t like from “Rebirth” was ‘Ontogeny’ which I felt was somewhat weak. Top marks, on the other hand, go to the production which really brings out the best of these compositions. Despite its Prog Rock characteristics, “Rebirth” is strongly inclined towards Jazz. Actually, scrap that. It’s just good music. Period. Check the review of the recent Twinspirits album elsewhere in this webzine.